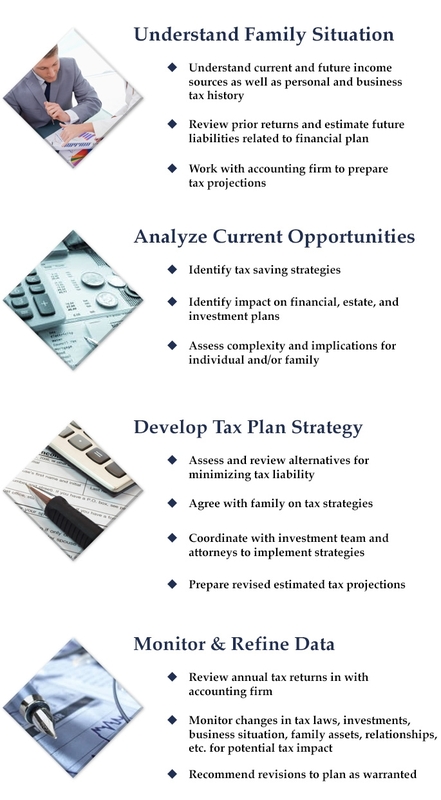 Appropriate tax strategies are a critical component of an overall financial plan. Income and estate tax considerations run throughout all aspects of the financial planning process. Archer Huntley Financial Services, Inc., develops strategies that factor income sources and their tax implications into the planning equation. Our goal is to maximize investment returns while minimizing tax liability. We work with your accounting firm to implement strategies and provide information for timely adherence to tax-filing requirements. Please review the chart for a summary of our tax planning process.